With their state mired in a historic homeless crisis and budget negotiations underway in Albany, low-income New Yorkers and housing advocates are urging Governor Andrew Cuomo to back up various press releases, State of the State addresses and previous budget proposals by finally funding long-term affordable housing development. As clergy in every community, we know its very hard to offer pastoral care to people who near homelessness. It’s tough to console people whose high rent forces them to choose between eating, affording a reliable car, dealing with unaffordable child care and coping with very inadequate wages. Survival is tough. After we offer a few grocery cards and say a prayer, we pick up the phone to see if we can secure more substantial help. Sadly, what clergy too often encounter is a patchwork of organizations which can sometimes help but all too often report that they ran out of money or the person in our office does not qualify. The maze clergy encounter is but a small foretaste of the even bigger maze that the tearful parishioner in our office is having to navigate. Today’s Read: Can Andrew Cuomo Really Deliver on His Housing Promises? With the deadline for the 2017-2018 State budget just hours away, tens of thousands of homeless New Yorkers will soon see whether Governor Cuomo keeps his promise by finally releasing desperately needed supportive housing funds. Although supportive housing is a proven, cost-effective way to break the cycle of homelessness for people with disabilities, HIV/AIDS, or other special needs, State leaders failed to sign a memorandum of understanding to release the vast majority of the funds set aside in last year’s budget for the first 6,000 supportive housing units of the 15-year, 20,000-unit commitment Gov. Cuomo made during his January 2016 State of the State address. Instead, the supportive housing funds were needlessly tied to other issues, with Gov. Cuomo and legislative leaders using them as a bargaining chip – essentially playing politics with the lives of their most vulnerable constituents. As the Coalition explained in our State of the Homeless 2017 report, any further delay of these funds would be catastrophic to the record numbers of men, women, and children languishing in shelters and on the streets. “One of the biggest problems that New York City is facing is record homelessness. The governor claims to be an expert on the issue and has publicly exhibited support for solutions, but the follow-through isn’t there,” says Giselle Routhier, policy director at the Coalition for the Homeless, which gave the State a ‘D’ grade for its lack of housing placements in their 2017 State of the Homeless report. A year ago, affordable housing seemed within reach after Cuomo announced a 5-year plan to develop or preserve 100,000 affordable housing units and a concurrent 15-year commitment to build 20,000 units of supportive housing— permanent, affordable apartments with on-site social services for formerly homeless individuals. Advocates hailed the pledge as a serious, long-term commitment beyond individual legislative sessions and executive terms and approved when state lawmakers included about $2 billion for the first five-year phase in the April budget. Those initial hopes dimmed at the end of budget wrangling in June when lawmakers agreed to allocate just $150 million—less than 8 percent of the initial allotment. The rest of the money remained locked behind a memorandum of understanding that would require signatures from Cuomo, Assembly Speaker Carl Heastie, and Senate President John Flanagan. “Governor Cuomo, whose promises to the homeless have as much credence as a degree from Trump University, needs to show that he understands that promises mean nothing if you can’t keep your word,” Coalition for the Homeless Deputy Director for Policy Shelly Nortz said in a statement condemning the MOU, an opaque process that also delayed affordable housing funds the State obtained in a 2014 settlement with JP Morgan over mortgage bond sales. In September, after months of pressure from housing advocates, Cuomo proffered his version of the agreement, which Flanagan derided as “a one-way MOU” and refused to sign. Echoing last year’s proposal, Cuomo’s latest Executive Budget would devote $2.5 billion over five years for the construction of affordable and supportive housing and has faced increasing pressure from the housing community— including 21 people arrested during protests at the Capitol this week. Meanwhile, advocates, nonprofit staff and formerly homeless individuals have assembled outside Cuomo’s Manhattan office every Wednesday morning to raise awareness about the governor’s unfulfilled commitment. Call Gov. 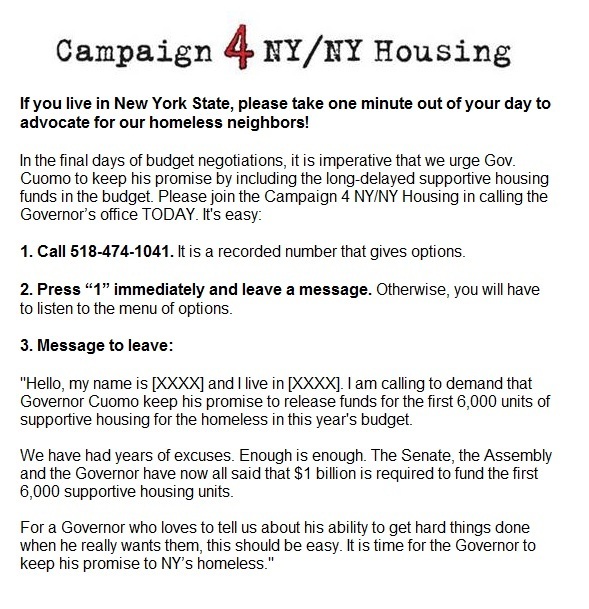 Cuomo today to urge him to follow through on his promise and release the supportive housing funds in this year’s budget.